What is the TAYGRA's Vegetable Leather ? Patented first model of the brandmark, TAYGRA Slims provides the best bare-foot sensation with all confort & protection. Light, flexible, coloured, fashion... this is the must-have from Brazil, easy to carry & perfect for in-doors sports, dance, beach, travelling, everyday’s life or MORE !!! By buying this product you can collect up to 5 reward points as a voucher of 1,00€. Your reward points. 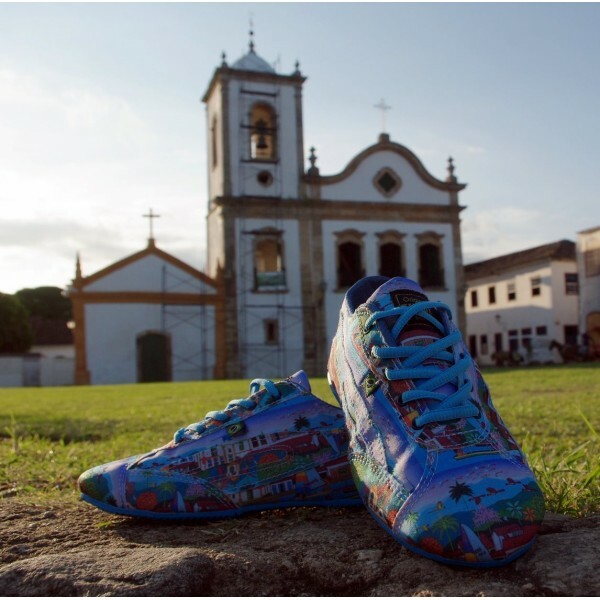 Made out of cotton with the printings of Paraty, the hostoric city that lays in the state of Rio de Janeiro. Support the Amazonian reforestation (“Curupira”'s project), small rural producers & the use of alternative materials. Fair-trade, Hand-made family production since 1989. EVA flat 5 mm thick insole. Effect : Barefoot style. Optional : Anatomic & orthopedic insole in gel, made out of rubber 100% recyclable & adhesive free.